How much money does your hospital throw into the dumpster every year? A few vegetables here, a pound of meat there. While it doesn’t look like much in the near term, it’s important to consider how this impacts your company on a monthly and yearly basis. Taking a hardline stance against waste reduction can go a long way in saving your facility thousands of dollars. Furthermore, it allows you to maximize every dollar you spend on product. Pinpointing “hidden” food costs is easier said than done. An inventory management system, coupled with a focus on waste, can put you on the path to success. Do you have staff responsible for the inventory process? Do these team members also keep track of food waste? It takes a structured process and attention to detail to achieve results. 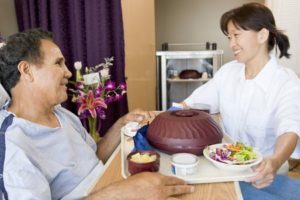 What method does your hospital currently use to measure food waste? If the answer is “none,” you have a tremendous opportunity for cost savings. If you have previously implemented a system, seek ways to make it better. Once you recognize that food waste is a problem in your hospital, it’s vital to understand why it is happening. By identifying the exact cause, you can organize a strategy to reduce waste. Purchasing the wrong quantity of food. Some food has a short shelf life; if not used immediately it ends up in the trash. Understanding of patient needs. Could food waste be a clinical or assisted related issue? If your hospital continues to struggle in regards to food inventory management and waste reduction, it’s time to plan for action. At Soriant Solutions, we have many years of experience providing medical facilities with waste reduction services. We can help you save money, boost profits, and increase customer satisfaction.